This year, we have a detailed list of items we are improving at the range, and we need your help to make it happen. 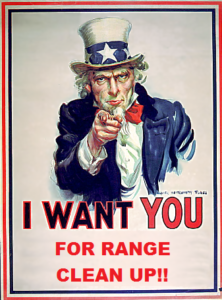 Its because of the range clean up day that we are able to have the facility we have, so I encourage everyone to come down, and make the range great!! We are all in this together, so I hope to see you there!! Replacing all target backer holders and OSB on entire range (rifle and pistol bays). Replacing and repairing wood competition shooting props and barricades. Spread out road mix to fill pot holes, etc. If you have them, bring your cordless drills (with screwdriver bits), sawzalls, and hand tools. If you don’t have any tools, not to worry, we will have some to lend out. And most importantly, bring the family out, it’s guaranteed to be a great time!! Since we are confident you’ll be hungry after all this hard work, Austin Hecker has once again volunteered to grill and provide a free lunch to all those who show up. If you would like additional information or have questions, please do not hesitate to email us at lastchancehandgunners@gmail.com. I look forward to seeing you on March 18! !